I have become quite fascinated by using HTML5 for rendering my GUIs on my Ubuntu applications. I love doing this, because I can continue to use Python as my library and desktop integration point, while being free to use cutting edge presentation technology. Didrocks was adamant that we should expose the excellent debugger (called The Inspector) that comes with WebKit in the template. However, I have found that for GtkWebKit, the doucmentation is sketchy (at best), and the API is unpredictable in it's behavior. So, it took us 2 hours of experimentation and trolling source code to make an implementation that actually worked for showing The Inspector. So, if you have been trolling the web looking for how to make this work .. I hope this works for you! 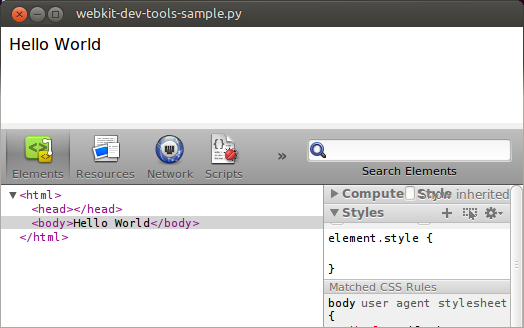 Without further ado, here is a commented minimial example of a WebKit window that shows the Inspector. I also pushed a branch with just the code in case you find that easier to read or work with. #data that I passed in when I connected the signals below. #cause "Inspect Element" to be added to the WebKit's context menu. #this does not work. Only using "set_property" works. 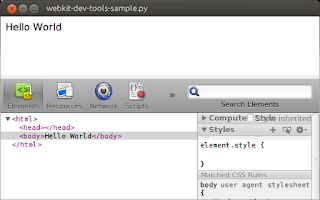 #Get the inspector and wire the activate_inspector function. #a place to add the Inspector to the GUI. There seems to be a lack of tutorials in this area. Do you know of any, or know any good example applications with simple code that can illustrate the concepts? The set_property was the key. Thanks! Awesome! Great work. I am really excited to give this a try. Nice! I wondered how to set the inspector to be a dock. Unfortunately it seems to have problems with resizing. Also, the middle breadcrumb-resizer bar doesn't come up when you click the "console" button (second at bottom left), and the scrollbars have no up/down arrows. Anyone know a solution for this? The bug persists in 13.04 beta as well.